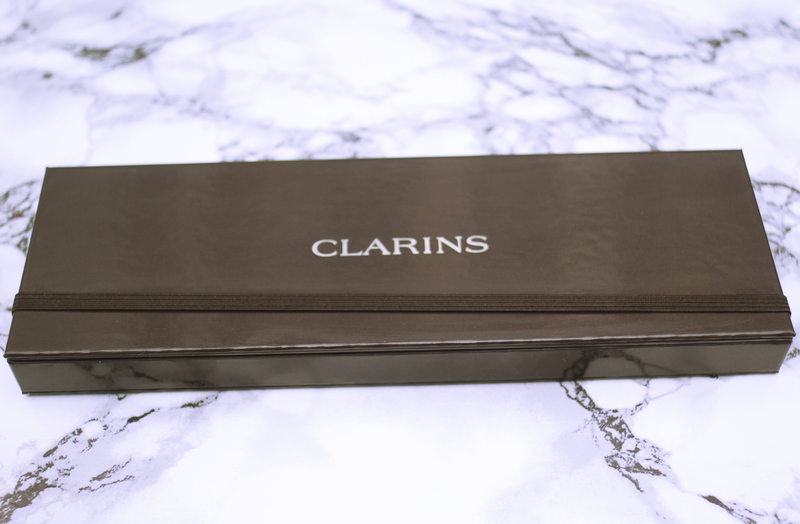 The other week, my Mum returned from a trip to town clutching a House of Fraser bag containing the Clarins The Essentials Eye Make-Up Palette. Mum is even more Clarins obsessed than I am and we have both had our eyes on this for a long long time now. These are quite tricky to get hold of in stores now but they do sell them online, so if by the end of this post, you fancy getting your hand’s on one, here’s the link. 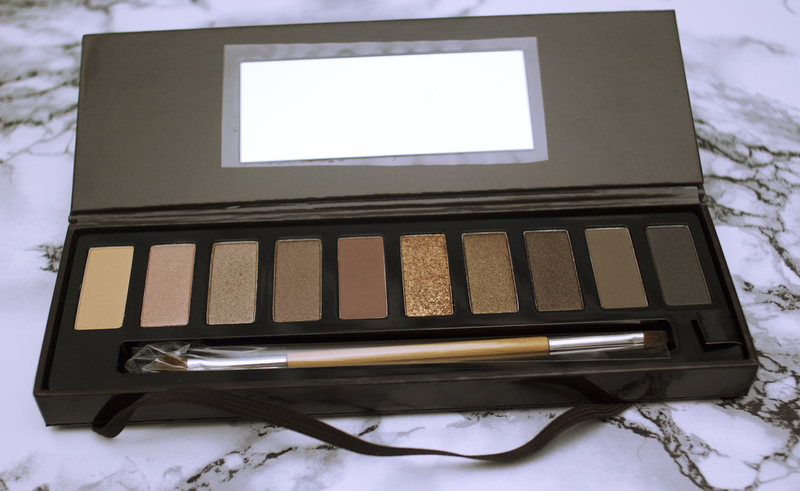 The palette contains 10 mineral eyeshadows in neutral shades ranging from pinky nudes, browns and taupes. I love all the colours in this palette and I feel like Clarins have picked really well when it comes to the shade selection. The only one i’m not a fan of is the light, matte cream colour. It didn’t swatch very well and I always find this kind of colour rather pointless as I would never ever reach for it. The eyeshadows range in finish which is a great plus, Clarins describe them as ‘matte, satin and pearl finishes with an ultra-soft texture’ although there is definitely one shadow that is more of a chunky copper glitter which is stunning! As with most palettes, this comes with a lovely dual ended fluffy brush with a wooden handle. This is a lovely addition to the palette and is great for make-up novices who may not have too many makeup brushes in their collection. This palette will naturally be compared to the likes of the Urban Decay Naked Palette and seeing as this is priced at £35, I can totally understand why. I feel like this would perhaps be better priced at £30 as it has two less shadows than the Naked Palettes but is only £2 less. Another factor that I feel Clarins should improve on is the packaging, it really is dull! The packaging is just a simple glossy brown cardboard box, with an elasticated strap to keep it shut. I just don’t feel that it is very luxurious or high end and perhaps cheapens the whole palette? I think if they were going with this type of packaging, it should have been in the classic Clarins red colour to make it feel like more of a treat? This may be just personal preference but it is a factor to consider. In terms of the formulations of these shadows, some are definitely better than others,my favourite is the glitter which is amazing! It swatches better than any other glittery shadow I have ever tried and looks gorgeous on the lid! The satin shades would be my second favourite, they are buttery in texture and offer a subtle sheen to the lid making them perfect for a daytime look. The mattes are probably the most disappointing of the bunch, there are three in total and they just don’t swatch quite as smoothly. On the lid they do blend out nicely though so overall all 10 are pretty great quality. I did swatch all the shades but then wiped them off without picturing them! Stupid I know, so sorry about that! I have used the shadows once with a little Urban Decay Primer Potion and they lasted really well. They looked lovely and smooth and wore really well throughout the day. I haven’t tried the darker shades yet but the lighter shades are a perfect day time option! I do plan to do a ‘Face of the Day’ post on my Mum with this palette soon so you can see what they look like on. I think this was a great option for my Mum and I will definitely be stealing them from her every now and again! What do you think of the palette and it’s colour selection? Have you tried this before? Such a pretty palette! Great choice of neutral shades! That shimmery gold shade looks amazing! Love the colors, very well chosen indeed. The packaging just looks rather cheap for a product this pricy, the elasticated strap makes it look drug store, not high end. A strange choice by Clarins, given how pretty the shadows are. I love how Clarins included a mixture of mattes and shimmers! This is on my list to check put! Can’t wait to see a look with these shades. I love the shades but the elastic do make it cheap looking… they should improve the packaging! oh! I thought it was one of the Naked palettes haha!